Denying people local government elections for two and a half years was caused due to political expedience. The weakening of the UNP and SLFP unity and the rift between factions should end forthwith; it requires that the national unity be extended to cover the full length of term ending 2020. The SLFP and UNP are both preparing to slip back to their habitual positions as electoral opponents in the hunt for the other at any cost and dominate the power pushing the country back to its perilous state once again. Alienated and conflicting governance yields little or nothing for the nation. They need to work jointly and collectively as one unit, confer with and settle on together. Fighting elections as rivals and then coming together on governance is meaningless if not ridiculous. Why the fourth place and not the third? There is no fight for the third; it is a foregone conclusion that one of them would grab it effortlessly. Both the Maithri-led SLFP and the JVP are capable of winning the third in their strongholds without much effort; the real clash will be at places in the Southern and Western Provinces where the JVP usually score more than 6 to 8% votes at any election. In the JVP’s power pockets, the SLFP would secure the fourth and vice-versa. At the January 8 Presidential election, Common Opposition candidate scored largely helped by the solid 37% UNP and 5% JVP plus 8-10% floating votes that went overwhelmingly to Swan. While Maithri scored heavily in the North-East and other minority concentrated constituents, which again are the traditional UNP or minority party votes and certainly not of SLFP. 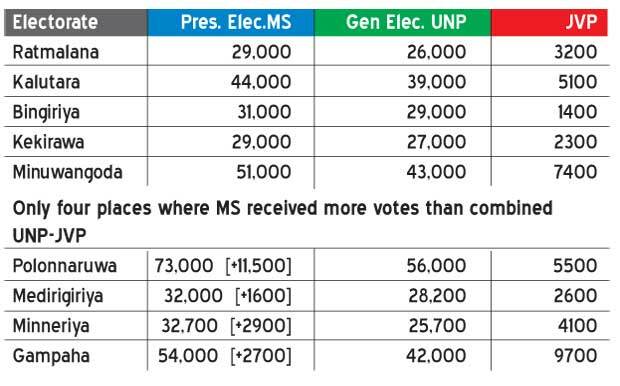 If all those votes were left out Maithri’s SLFP could muster a pathetic 1 to 2 percent of the total as the statistics reveal on the outcome of the two elections held in 2015 January and August: even that meagre percentage was the 10-12% SLFP vote that he was able to muster in the Polonnaruwa District 20,000 approximately along with a little support from [about 3000 votes] he collected from Gampaha electorate in which his birth place Yagoda is situated. The situation may have changed marginally over the past three years in favour of The President. Surely, after three years of presidency and consolidation of party leadership by him, but talking to grassroots level SLFPer, there is only an insignificant shift. The large majority of the SLFP supporters are ‘eagerly waiting for an opportunity to teach a lesson to some who sold the party to the opponents’. All the SLFP stalwarts that supported Sirisena for personal reasons lost at the August election; should they be brought back into parliament though officially permitted but in an unconvinced way? Such action and his virtual failure to perform determinedly have badly diluted his authority as a leader. Clearly, he has exposed himself as a person provoked by political convenience. The proud and prompt statements made by the two self-conceited General Secretaries of UPFA and SLFP in response to the trial-balloon message by Minister Senaratne is an unwise decision. Rajitha, is a veteran politician who possesses a proven ability, and had assessed the strengths and weaknesses of his party against JO’s stands in the area. He appears to be somewhat anxious over the chances and his thinking cannot be discarded as thrash. Minister Senaratne is a master strategist, shrewd political craftsman and tactician who can proudly claim to be fairly accurate in reading the pulse of the people. His exemplary past record at forming alliances, new parties, changing parties, instigating cross over at the right moment, to remain with the winning side irrespective of who wins or who loses, is no secret. At a media briefing held recently, he, for the first time revealed that he did not follow Maithripala Sirisena but it was he who followed him when he prompted that historic cross-over exactly three years ago in November 2014. On the other hand, there is a strong hunger among the grass roots in the SLFP for a reconciliation between the two factions led by the President and ex-President. They think a united SLFP could easily defeat the UNP. If an accord is reached, they will be forced to drop corruption charges against the Rajapaksas and their cohorts. The problems this nation faces today boils down to the persistent pursuit by the leaders and factions to gain power, retain power and not to lose it at any cost. The political culture has changed drastically; today, the success story is the ‘survival of the fittest’, ability to change and fit in to the circumstances, rather than attempting to change the circumstances. The UNP, at the last general election was competent to come off as the superior of the two in a nation where a feasible third force is not in sight. Whether battle against fraud and corruption would be a certainty or just a set of slogans used in an election and ignored immediately, remains to be seen. Warming up to fight it out? If the two factions of the SLFP unite, the President will face a severe problem in taking policy decisions on controversial issues like action against corrupt men in the SLFP faction led by MR. The President and the Prime Minister who have been together since Jan 8, 2015, are now warming up to fight it out between their two parties and the proposed third-party of the Rajapaksas. If the UNP were to secure the majority of local government bodies, and the SLFP comes 3rd or 4th; can they sit together in the Cabinet and continue as a unity government for another two years? Worse what are they going to do at the Provincial Council elections that are due in the same year? There was a common urge of the nation for a change at the end of 2014, not just a change of government but a regime change, a transformation in the ways and style of governance – the ways of governance, both at the national, local and provincial levels. The two leaders have a herculean task to perform as a united force more than to engage in election rivalry. Political parties may now and then answer popular ends, they are likely in the course of time and things, to become potent engines, by which cunning, ambitious, and unprincipled men will be enabled to subvert the power of the people and to usurp for themselves the reins of government, destroying afterwards the very engines which have lifted them to unjust dominion.” …GEORGE WASHINGTON — September 19, 1796.